My three-year-old son Riley had his third open heart surgery on March 23rd and he's still in the UCSF pediatric cardiac intensive care unit. Fortunately, Father in Chief, Grampy, and I are all taking turns with the overnight shifts. That schedule allows FIC and I a chance to sleep in our own bed every third night or so, even if we don't actually feel refreshed in the morning--we're just too emotionally and mentally exhausted to have a night of sleep perk us up. It's been a frightening ride but we're on the road to recovery. We don't know how much longer we'll be here: maybe a week, maybe months. But we're grateful that our little guy is alive and we're desperately looking forward to having our old lives back (and our own beds). We've already celebrated two birthdays in the hospital (FIC's and Riley's) and are hoping there won't be a third (the next one would be the birth of our second son--due July 2). Follow the progress on Riley's blog. *Much of this was lifted from FIC's blog... too tired to organize my own thoughts. His cheeks look nice and rosy in this picture! Hope you're managing... I'm sure it's hard especially being pregnant. Amazing what you are capable of when it's your child's life you're working for. Hang in there girl... rooting for you and Riley. :-) Give him hugs from me (and hell, here is some virtual HUGS for you!). You popped into my head tonight and I decided to see how you were doing. I had no idea your little guy was so sick. Hang in there and take good care of yourself. So many of your blogger buddies are cheering you on. 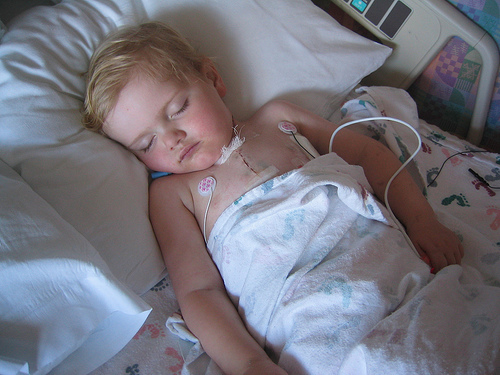 My son had serious illness at age 11, and so I have an inkling of how you might feel. Your boy is fortunate to have you and your co-pilot, and what a devoted grandfather! Be sure to eat when you can, and trust your instincts. Hoping all turns out to be fine. Suzanne, I've been following Riley's progress on his blog. I'm glad to read that he is finally home! It's amazing how quickly kids can bounce back... though I know he still has some recovering to do, I'm glad to read that he is eating and playing. Hang in there. If you wish to be included in my list of nominations this Saturday evening please email me at Margiemix@comcast.net Tell me a little about yourself, why you choose to blog, what's your biggest challenge in being a Mom and how do you keep your own identity while being a Mother at the same time. Stuff like that. I look forward to hearing from you.